Good fit and quality. So very pretty! I was surprised on the quality of this item for the price. It is like one I had that I paid a lot of money for but I had to lift a king size mattress to remove and put on and that is why I wanted one to just wrap around. It was so easy for me to put this one on my king box springs and it looks very nice. The bedskirt is perfect for bed. I couldn't be happier with ths skirt in fit, ease of attaching to bed,not touching the floor and very attractive in style. Very pretty bed skirt. Nice quality. It was perfect! I Love it! I love the way it stays put on the bed. I have a motion bed that moves up and down and this moves right with it. 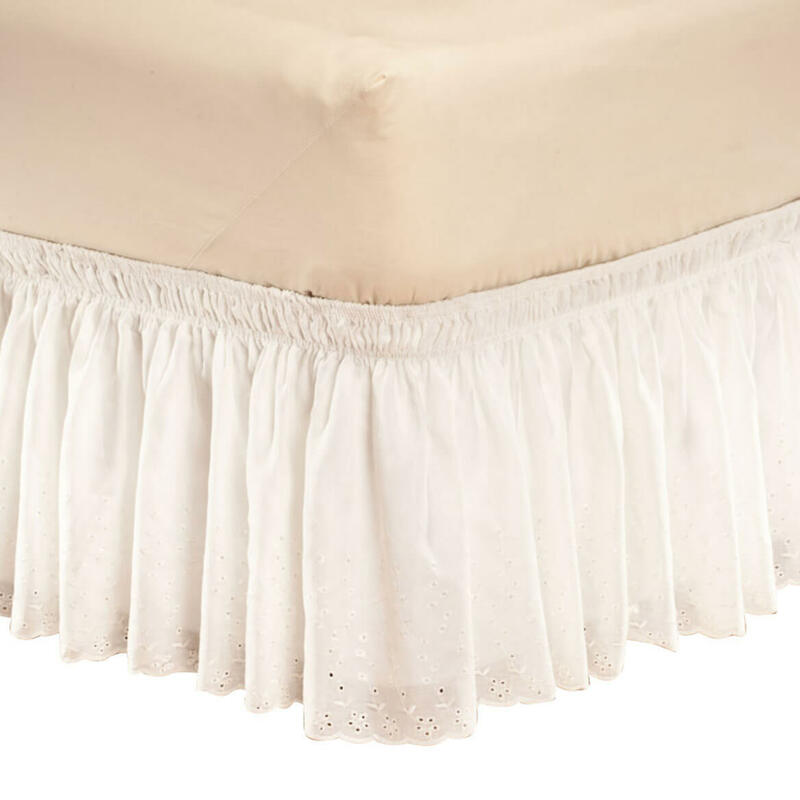 No longer find it easy to take skirts with under mattress panel off and put back on bed for washing - so this bedskirt that just wraps around is perfect. Best used with bedskirt pins. An Easy Way to Satisfy a Need! I was happy that I purchased this item. If I had bought a bedskirt that fit over the entire boxspring, it probably would not have fit as well due to the variety of single/supersingle boxsprings. 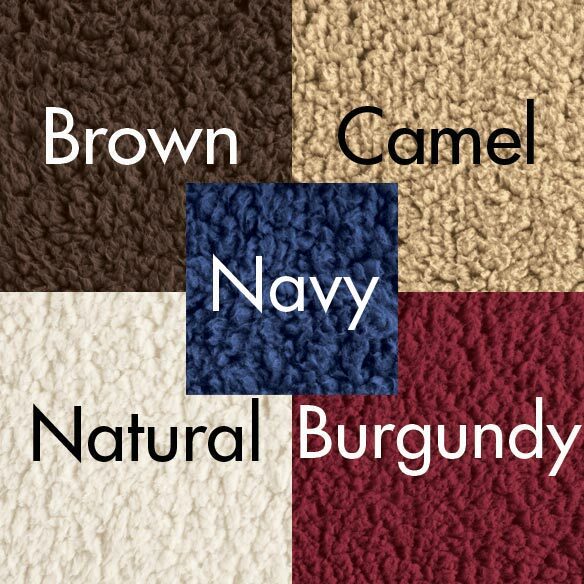 Attractive accent for your bedding. I purchsed both colors. Both are great. I use the white in my guest room and the ecru on a single couch/daybed. The eyelet gives a pretty look under bed covers. They wash well and no ironing. Good value products. This product is used with my quilts my Mother made for me. It really looks great. My husband and I are senior citizens and it is very hard for us to change the bedskirt by raising the mattress each time. I ordered one for the spare bedroom and put it on myself today after I ironed it while he was out fishing. You can adjust where you actually want it to fit on the box springs.I am getting ready to order another one for the master bedroom in the other color. Someone should have thought of this a long time ago. It fit my queen bed great! 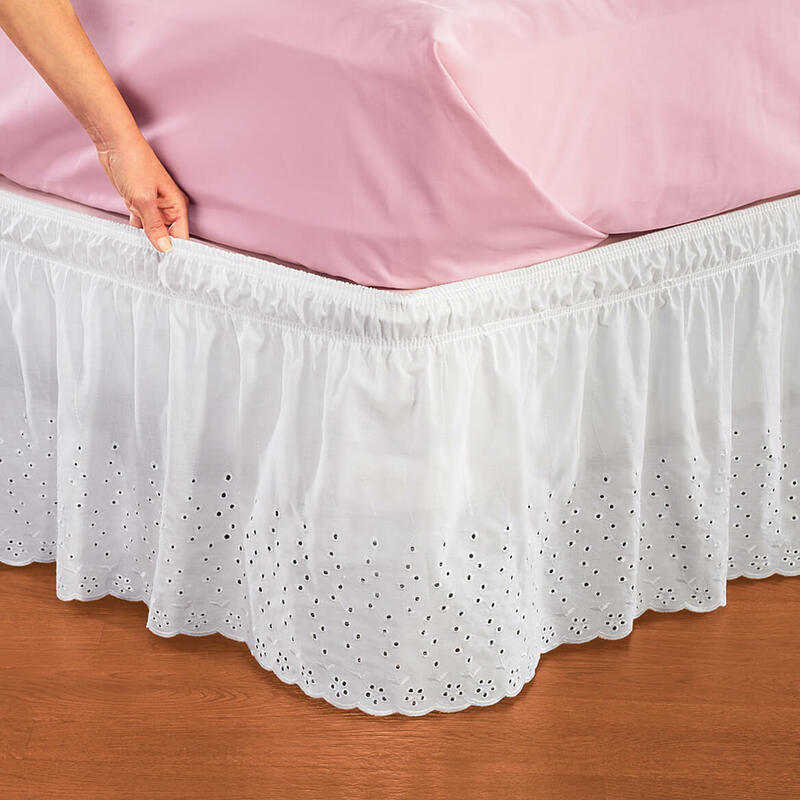 I took a chance ordering because I have long admired eyelet bed skirts in pictures. I must say I had low expectations because of the price. However,I am blown away with the quality and beauty of this one. This is definitely worth the price and more. I needed a new bed skirt, and I wanted ruffles and so I got the old blue one off the queen bed and put this queen size ruffle on and it looks great, thanks. This is a perfect compliment to a feminine comforter. I love it and wish it came in more colors. It is so easy to put on. No more struggling with the box springs and mattress. Wasn't sure what to expect but we put the bed skirt on the bed with little fuss. We haven't had an issue with it and it looks great. Fits the bed perfectly. Love the elastic band at head of bed. A great buy for a bargain shopper like myself. The queen bed skirt is a good fit, still allowing a bit more stretch for adjustment, but not sure it would have enough give for a king bed. I used bed skirt pins to secure it. Otherwise, I could see it tended to slip up over the edge of the box springs and under the mattress. I'm many"years over-the-hill, but was able to put the skirt on without help. I bought the beige and it looks nice against my ivy green carpet topped with a lilac comforter. I needed a bed skirt for a guest room bed that I had made a quilt for. Bought from stores and tried several that just didn't work due to fit, color, style. Ordered this one, rec'd it in good time, put on, looked grt, wrinkles dropped out without ironing. Color, fit, style perfect. What a great idea. I love the bed dust ruffle with the elastic sides-----------no more lifting heavy mattresses. It was easy to put on and it looks great, I'm very happy with it. I have never been able to put a dust ruffle on my electric bed because of the medal bar at the foot. This works perfect. Nice and easy to use! Very pretty too. Nice and easy to put on the bed. Just what I was looking for . So easy to put on and take off. I dont have to ask for someone to help me!! And they look really nice. 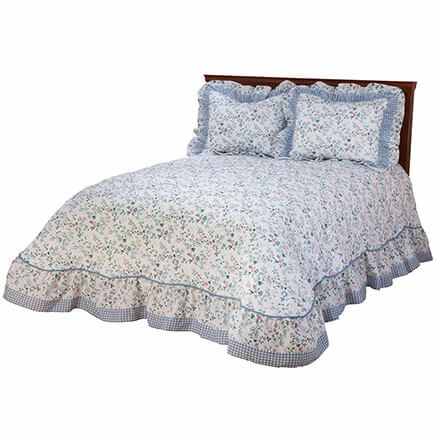 This eyelet bed ruffle is exactly what I was looking for. When shopping for one in stores the price for the size I needed was rediculous and they were no better than what I bought here on Miles Kimball. It fits my full size bed perfectly, it's elasticized so it's super easy to put on and the 14 inch lenght is just right. The eyelet design is so pretty and fresh looking. I'm very pleased with my purchase and would recommend this lovely bed ruffle to anyone looking to freshen up the look of their bedroom. I cut the elastic and tacked the ruffle to the bed frame to prevent slipping. bought this for gift. person receiving item had looked in our magazine and told me the color and item number. When received she told me it was just what she wanted. It fits my bed perfectly and is just what I was looking for. I have everything positive to say about this item. I'm not able to lift my mattress to use a bed skirt. This one slipped right on over the mattress after washing and drying. A good blend of fabic makes for wrinkle free laundry. Too bad the elastic eventually wears out. Easy to put on a king-sized bed. It sure beats lifting a mattress on and off. The elastic tore off both ends while stretching it to fit the bed. I had to reinforce the stitching by hand---took only a minute and solved the problem. The ruffle sags and drags on the floor. It needs to be pinned to stay in place. Attractive. This is very pretty and attractive but is almost a little too tight to fit on the king size bed. I had to wait for my husband to get home from work to have him help me get it around the box spring. 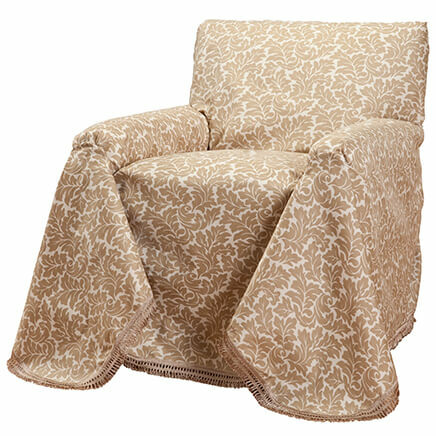 This dust ruffle is very attractive and fits both queen and king beds. It would fit better if only for queen. A perfect solution for not having to lift a heavy mattress. The bed ruffle really looks good.....have had several positive comments. It was wrinkled when I took it out of package, but a few minutes in the dryer with a damp towel and every wrinkle came out. Only 1 minor problem....the elastic sagged in the middle and had to use small saftey pin to keep in place. Changing the dust ruffle on my queen size bed was a challenge. This design makes it simple. My only problem is that the elastic is too "stretchy" or too long. It does not want to stay in place. I have other dust ruffles of this design without the problem. Pinning it to the box spring helped. I like this one because it is so much easier to put on the bed. I am tired of removing my mattress off the box springs to wash my bed skirt. I have been wanting a beige colored eyelet bed ruffle. it apeers to be easy to attach to the bed. I also like the eyelet material. lOVE ITEM & PRICE..THIS IS MY 3RD ONE !! Ease of putting it on the bed. Needed it to go with a quilt in a guest bedroom. Lovely eyelet ruffle!! Have white haired dog and like eyelet. Can't lift mattress to put regular bed ruffle on. 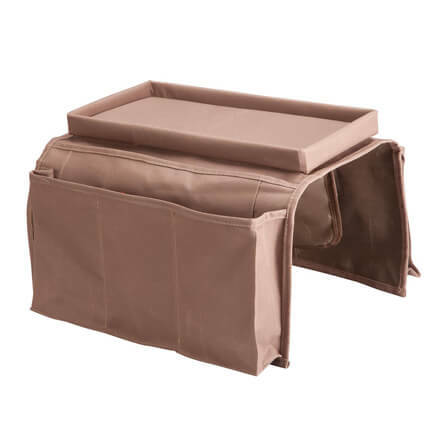 Was looking for something with ease of putting on bed vs one that fit over the box spring and without having to remove the mattress all the time to was bed ruffle. Two items were on my want list. When the new catalog arrived both items were pictured. One was even on sale. At my age, with osteoporosis that has already caused 3 compression fractures in my spine, I can't lift mattresses anymore. This will make it so much easier to change the look of my bed. Very beautiful for our queen size bed. Easy to put on and take off for washing. Do not see eyelet much I think it is pretty. I chose this because it will match my comforter and give me a look that I really desire for my bedroom. I can surround my bed with beauty without lifting the mattress, easy on, easy off. does it come in ecru? BEST ANSWER: Thank you for your question. The White Eyelet Bed Ruffle does come in Ecru. We hope this information will be of help to you. Do you have any longer lengths for a king-sized bed? I need a 22" length. BEST ANSWER: Thank you for your question. 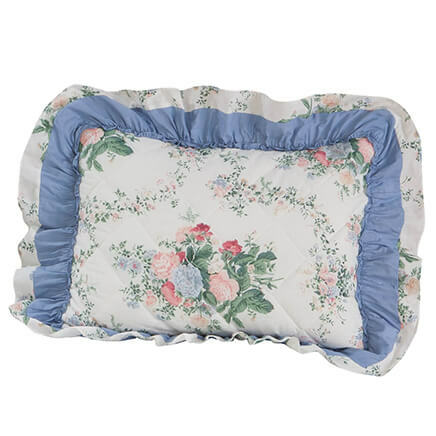 Unfortunately, we do not have any longer bed ruffles, we only have the 14" long ones. We hope this information will be of help to you. Does this ruffle only come in white and ecru? BEST ANSWER: Thank you for your question. 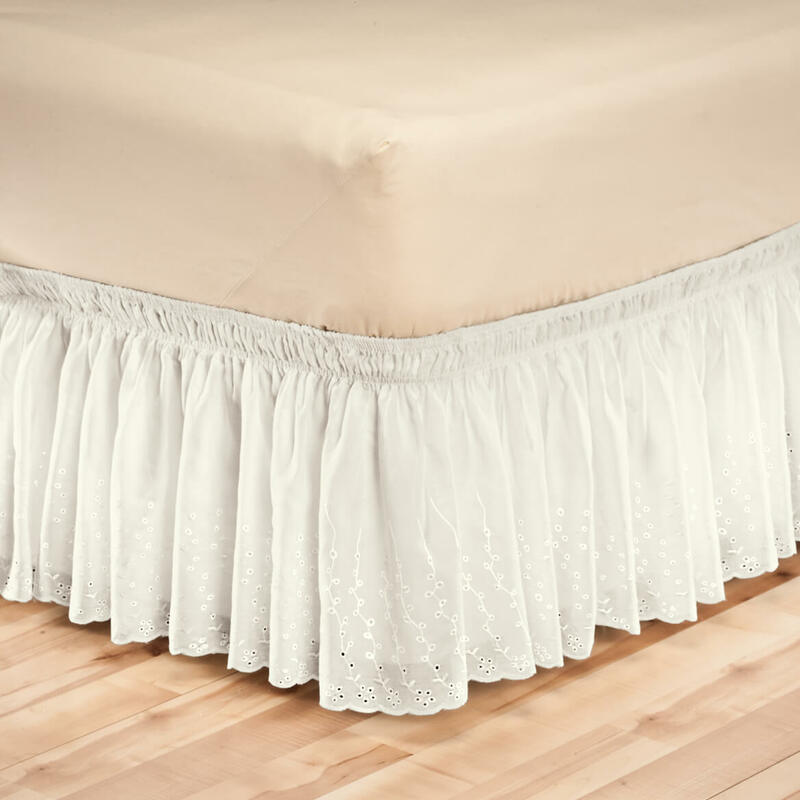 At this time the Eyelet bed ruffle does only come in the White and Ecru colors. We hope this information will be of help to you.